April 2, 2009 - AT&T unions and employees approximately 125,000 workers are poised to walk off the job on Saturday at midnite. AT&T employees are threatening a possible strike for several issues regarding employee wages, retiree benefits and healthcare. A critical issue is the company wants union workers to pay more for healthcare costs. The workers who may strike are the AT&T call center and service representatives who take your calls about landlines service and wireless phones service would not be affected. At&T management is preparing for the contingency plans. "We have been planning for the possible strike for some time and we are very prepared," said a company representative. 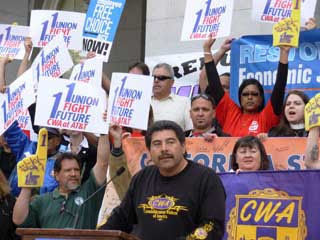 Communications Workers of America(CWA) workers have recently gone on strike before. It was five years ago, and eventually, they came to an agreement. The latest agreement is set to expire at 11:59 p.m. on Saturday. A spokesperson with AT&T says it is a competitive market right now and these are tough economic times, but the company is committed to negotiating a contract with good wages and benefits. Both sides would like to prevent a strike and say a contract extension, while they continue negotiating, is possible.